This spacious beachfront condo is a 2 bedroom/2 bath corner unit on the 2nd floor of the 10th (southside) building. The additional large window on the south side provides extra light and views of tropical greenery. 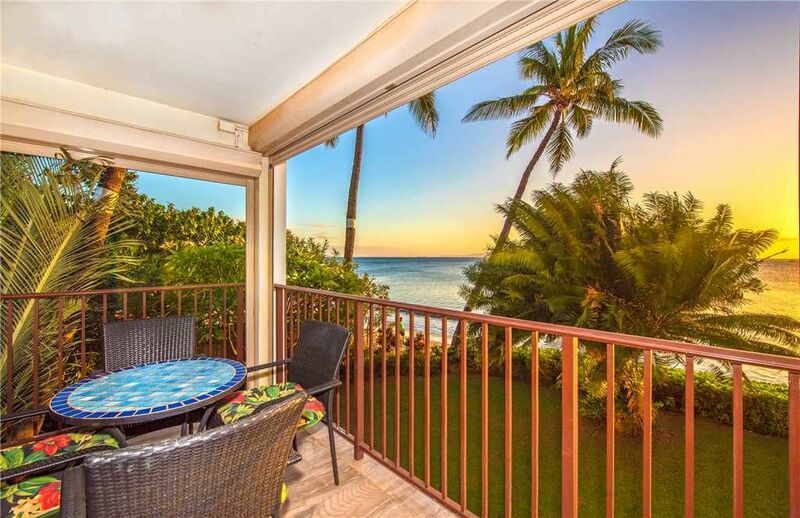 Unobstructed ocean views from the living area and master bedroom are extraordinary, stunning. Both bedrooms have en-suite bathrooms. King bed in master, twins in 2nd bedroom & sleeper sofa in living room allow for 6 guests. This condo is cool looking and feeling with tile flooring throughout. Prep meals in the full kitchen and enjoy watching the outriggers launch, practice or race from the canoe club next door—or use the property’s gas grills and chat it up with fellow guests, locals call that talking story, a simple aloha kind of thing that enhances every vacation. Flat screen TVs with complimentary cable, WiFi, local phone; central AC and ceiling fans. The in-unit washer/dryer is super convenient as is the free parking. We loved the condo. Perfect location! The condo was fully equipped, spacious, clean and neighbors were friendly. Would love to go back again! Highly recommend. Fantastic ******* Excellent location, Great experience for first timers. Mahalo for your feedback! We hope to see you here with us again. We've stayed in this unit 3 times and have booked again for next year. We love the location, unit layout, manager & staff and the friendly people who return the same time to vacation each year who have since become our friends. Thanks for staying with us again! We're so happy to hear your enjoy the time you spend with us, each year. We look forward to your next stay. Mahalo! Beautiful view, access to beach, grounds and pool well kept, & great bakery across the street. Condo had all the needed amenities and more, Kitchen was very nice and user friendly. One of the bathrooms is pretty challenging and the condo needs a core cleaning. Mahalo for your review. We appreciate your feedback and will make sure to take a look at the bathroom and get a deep clean done in this unit. Thank you for staying with us! We had a great vacation. The accommodations were great, there were a couple of small issues with furniture and a fan but they were looked after by our very helpful contact Danny with the rental group. The condo was clean and well kept. The location right on the beach was perfect. You could tan on the grassy area between the condo and the beach or take a chair or towel and lay on the beach. Being right across the street from a farmers market, bakery, Maui Shaved Ice, and an ABC store was also really handy. The staff at the condo were very friendly and accomodating as well. Mahalo David! So happy to hear that you enjoyed your stay with us and were able to relax. We appreciate you letting us know about the issues while you were here, so that they could be taken care of in a timely manner. See you next time! Aloha. Property was absolute oceanfront! Condo room was very spacious and clean. Beds were comfortable too. Grounds were well maintained. I would recommend this property to family and friends. Thank you Thomas! We hope to see you again soon! Aloha. Treat yourself to the vacation you deserve at Kihei Beach Resort. This 6 story condominium is located on the beautiful Sugar Beach just 15 minutes away from the airport. Stroll on this soft sandy beach that stretches uninterrupted for over 6 miles. Witness the early morning canoe paddlers right from your lanai (patio). Enjoy seasonal whale watching, romantic sunsets, and an amazing view of the outer islands. Take a step across the street for fresh fruits and vegetables from our local farmers market. A perfect location for the vacation you deserve!